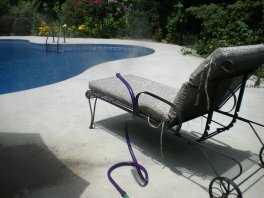 If you are looking for a very economical way to cool down there are some great inexpensive and portable water misters. These are quite inexpensive - from $10 to $25 so you can buy several of them and place one near your patio table and another near your lounge chair. However, these inexpensive models don't create the very fine mist of a more expensive misting system, so if you sit next to one you will get damp. 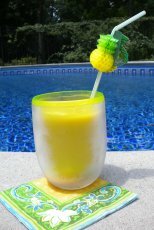 A water mister and a shade umbrella keeps you and your guests comfortable on those hot, sunny days by the pool. A mister works on a very simple principle - water is forced through a very small nozzle which creates a very fine mist. Once these tiny droplets of water are exposed to the hot air, they quickly absorb the heat and then evaporate. This is known as Flash Evaporation. Flash evaporation cools the surrounding outside air. Outdoor misters can drop the temperature by up to 30 degrees F.
It does not work by getting you wet. The purpose of an outdoor mister is to have the mist evaporate into the air as fast as possible. The flash evaporation is what cools the air. This is a great, inexpensive way to drop the temperature out by the pool - especially for the guests who don't come in their swimsuits or don't swim. I have used the one you see pictured for pool parties. 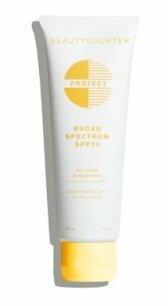 The stand is about 3 feet tall and can be bent and shaped into any desired position to get as little or as much spray as you want. They have been great for our pool parties on a hot afternoon in Georgia as there are often guests who don't swim or get in the pool, yet they can stay comfortable if they are near one of these misters. It works with any standard garden hose. The guests who sit near the mister said they liked the cool air especially when there was a breeze. We kept the outdoor mister far enough away so that no one got damp, but were able to enjoy the lower temperature. Home Depot sells them for $9.99 but when these water misters come in, they go really fast. We have been using the Portable Misting Tower by Aeromist for several summers. It was especially a big hit when we entertained many Minnesota friends on a hot Georgia day. It is a tripod shape and has a stainless steel spray bar that can be adjusted to any height between 36" to 71." 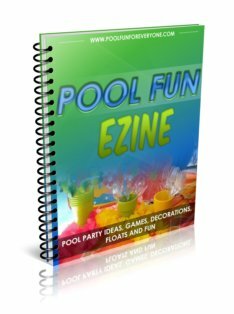 Simply attach the hose to the base and place it anywhere around your pool area - near your chaise lounge, pool seating or outdoor patio table. Of course you can use the outdoor mister in other places as well. 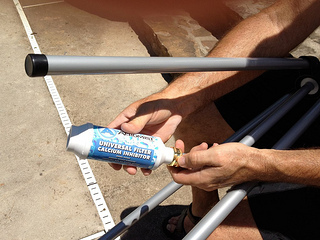 I like to place it wherever I am doing some gardening - it keeps me cool and helps to hydrate the plants. It is recommended that you also attach a water filter cartridge to the base to prevent future clogging which we did. There are 5 spray nozzles that can be adjusted to control the amount of mist. The mist really does help to cool the temperature. Humidity does determine the effectiveness of the mister. First, misting does humidify the air - so outdoor misters are especially effective in hot, dry climates like Arizona. Does that mean if you live somewhere humid like I do in Georgia that they are not helpful? Many people in humid areas like Florida and Georgia do use misters. But, you may want to consider a misting fan if you live in an area that has high humidity. This is due to what is called relative humidity. Basically what it means to you is that the lower the relative humidity is, the more water is vaporized which means more heat can be removed. If you live in a low humidity area, like Arizona, misting works great without the fans, because of what is called flash evaporation. However, when relative humidity is over 80%, you can achieve the cooling effect and drop in temperature by combining misting with fans. A fan provides conductive cooling - it cools the water to make a chilled mist. If you ice the water supplied by the misting fan you get even cooler temperatures. 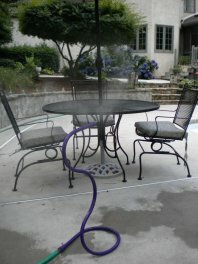 An outdoor misting fan can be put on your porch, out on the patio or on the pool deck. Not only will the misting fan cool the temperature, but the breeze keep the bugs away as well. A fan mister works by blowing a fine mist into the air. The water then evaporates which then absorbs some of the heat from the air and helps to cool off or drop the air temperature. Portable fan misters have a large water tank and have the benefit of being placed anywhere on the pool deck because it doesn't need to be hooked up to a hose. It may be best to use distilled water otherwise the minerals can clog it up. Since they are not connected to a hose or have an electric cord - they are the best for portability. This one from Amazon holds about a gallon of water which lasts around an hour. There is a variable setting for how much mist you prefer. If you don't mind getting wet, set it high and sit close to it. Otherwise lower the setting and move the fan farther away for a drier cooling experience. As with most misters and fans it won't cool off a large outdoor area. It benefits those who are sitting close to it. A personal mister is an inexpensive and portable way of keeping your or your guests cool. There are a variety of inexpensive styles to choose from. I bring a mister with me out by the pool to keep me cool (in between dips in the pool) when I am reading a good book or magazine. We have also made them available to our guests who aren't the pool type or elderly guests who enjoy being outside, but aren't swimmers. 1. Fill bottle to the marked fill line with cold water (do not fill to the top, as the bottle needs to contain at least 20% air to work properly) - you can add ice, too, for an extra chill. 2. Screw the nozzle cap on the bottle and give it ten good up-and-down pumps. 3. Press the trigger, and a mist or stream flows from the brass nozzle. Rotate the brass nozzle to the left gives you a fine mist , or adjust it to right to shoot a concentrated stream of water. Do not over-pump. The water and air inside the bottle, with the help of the bottle pump, will provide a light cooling mist. I keep mine in the refrigerator so the water is really nice and cool. There is no need for any batteries. To keep the bottle cooler long you can also get a neoprene insulated sleeve. Consider a personal mister to keep yourself (or guests) cool on hot summer days. Even better - combine a mister and a fan and now we're talkin' really cool. First you pump the "EZ pump" then just push the mist button. The fan is turned on by sliding the on/off switch. This one requires 2 AA batteries (not included). Fill it with cold water for an even cooler mist. Of course it is so portable it can be used for outdoor sporting events, concerts, trips to Disney, or the beach. Please note this a set of two misting fans - not just one.